... 5 bottles of Texas Pete Hot Sauce! This is a year's supply for us! I checked the 'best if used by' dates on the bottles and they were all sometime in 2020, by that time they will be all gone!!! Each bottle was $.98, multiply that by 5 and it gave me $4.90. We purchased these in a state that does not charge tax on food so $4.90 was what I spent. $10.75 - 4.90 = $6.05 which I will roll over into next week! I'm getting some staples stocked in my pantry with this challenge and it sure does feel good. What about you, how did you do with your $5 pantry building challenge this week? A Working Pantry is now on Instagram. Come follow me there! 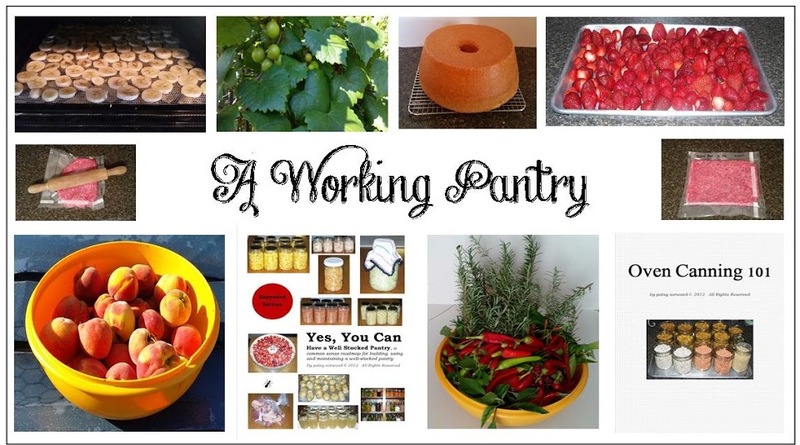 Come follow A Working Pantry on Facebook HERE. You can also follow me ... on Pinterest! If you are blessed by what you read here and would like to help financially support my writing, you can do that by making a small contribution by clicking on the donate button. I would be very grateful! Hello Patsy and everyone from Australia :). How wonderful Patsy to add more hot sauce to your pantry and tax free as well it all really helps to build our pantries bit by bit :). - Saved pumpkin seeds from our last two pumpkins in storage costing $0 for our planting as well as some to sell on the internet too. This added income helps us offset our gardening costs. - Washed, cut the skins off and diced our remaining pumpkins and boiled it making 6lts of pumpkin puree for the freezer we can use for meals when it gets cooler or for mashed pumpkin with meals. We put the puree in saved ice cream containers we had washed out for ease of storage. 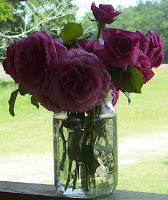 - Made $4 from the sale of saved garden seeds from the gardens which I will put into our pantry budget to recoup some funds used for our bulk pantry stockpiling when the funds build up more in my PayPal account. Hope everyone has had a wonderful week of finding bargain purchases for their pantries :). Sewingcreations15, You were able to use almost the whole pumpkin, way to go! Recycling the empty ice cream containers is another good idea! Thanks for sharing! Most welcome Patsy and I hope it helps others :). We also use the ice cream containers as storage containers for small amounts of flour and other staples on top of our kitchen pantries too. I meant also to put in that the pumpkin skins and stringy bits then were trench composted into one of the vegetable to add nutrients too. Also one I forgot to put in is that we purchased 3 whole chickens on special for $3.50kg and then coupled that saving with another 5% off using our roadside assist grocery card too. That also tops our freezer for whole chickens for a while. That would be a 5-year supply for us!!! We go through lots of taco sauce that is milder, though. You guys must know how to enjoy your hot sauce, and you must have tough palates:). I love seeing what everyone likes and eats, especially when it's different than how we eat! I have nothing new to report this week. I haven't been shopping for a few days, and don't plan to go for a few more. We'll see what they have then. My husband picked up many good pantry-stocking items last week, so that is good. Becky, We do enjoy hot and spicy foods! I haven't purchased groceries in about 2 weeks now other than running into a store, for items for this challenge, when we were already out and about. Doing once a month grocery shopping is working well for us. I made a trip to the big city for cheese. They had it for 3$ a pound so I bought 12 pounds. I hope that will last a year since I had a few pounds to start. A pound a month doesn’t sound like enough so we shall see. I also went to Target for their gift card deal on toiletries. I used gift cards I already had so no out-of-pocket. I bought three deodorants for my husband and one conditioner for me. I’d really like to go through our stock and try to figure out what a years worth of our favorites would be and go from there. My husband likes hot sauce, too. After having an ulcer, my cast iron stomach can’t handle it anymore, sadly. I'm laughing at your 12lbs of cheese for the year, Debbie. I love cheese and use it in a lot of recipes. We use about 1lb or more of cheese in a typical week, more or less. That doesn't include holidays, where we might buy specialty cheeses of a cheese tray. I know that cheese is expensive, but it sure adds lots of flavour! A few weeks ago, my regular grocery store had a sale on their name brand peanut butter, $1/1kg jar. I think they received too much, because since the sale, they have had this peanut butter @ $1.25/1kg. Usually I am happy to stock up when it is $3/1kg. We are massive peanut butter lovers. Although this is not our favourite brand, I have diligently stocked up on the crunchy variety each week. This week I bought another 6 jars, for $7.50. I ended up buying a bit more groceries than anticipated, so I also used a GC for $25 in free groceries. Most of my grocery shopping at this point is pantry stock up or replacement of stock that ran out anyways. Rhonda, my husband eats a lot of peanut butter so we try to keep plenty on hand as well. Glad you had the GC and could use it to get free groceries! I'm a little pickier for PB for sandwiches, but I regularly use the store-brand for baking, and surprisingly, my store brand has less addatives than the name brand, making it the better choice for use in my pup's treats. 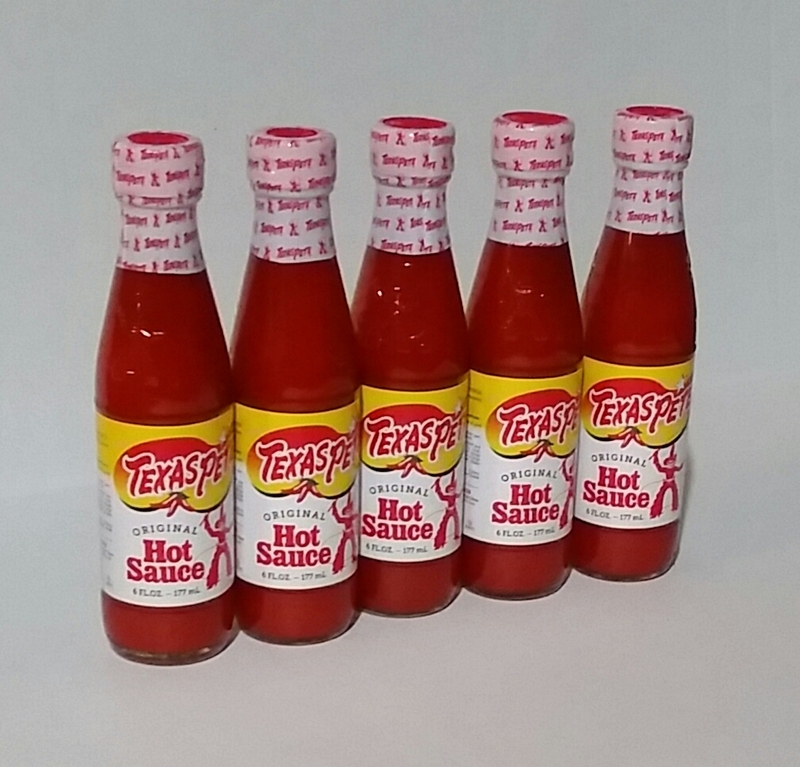 One bottle of Texas Pete is a 2 year supply for us! We are hot food wimps! We added 8 cans of Luck'S blackeyed peas for a total of $1.92. These are a go to quick meal for us with a pot of rice and a veggie and a sliced tomato. We can hardly eat a less expensive meal at this price and we love it. Lana, that's a good price on blackeyed peas! I would stock up for sure if I found them for that price! I bought 10 more pounds of fresh chopped onion and before I put it into ziplocs to freeze, I googled to see how many cups of chopped onions were equal to 1 medium onion since many recipes specify the number of onions rather than cups! So I labeled each bag that way! They cost me $2. I also bought 10 pounds of fresh chopped celery for $2 and I’m dehydrating them . I bought 5 pounds of fresh shredded carrots for $1 that I will use in baking and will freeze the leftovers. gardenpat, that's a good idea about the onions! Those are good prices on the onions, celery and carrots! I need to shop where you shop!!! Just writing to encourage everyone in their pantry stocking as recently a family in our fellowship needed meals to help due to loss of income and thanks to my freezer pantry as well as our dry pantry goods, I was able to help. This family is vegetarian therefore all of this past year's veggies in the freezer came in really handy. 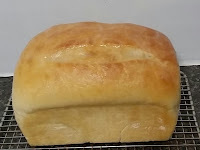 I was able to provide 3 meals plus baked goods each week for almost 5 months now mostly from things I had canned, frozen or stocked at bargain prices. An added plus is the fact that we are about to butcher our first ever grown on the farm steer and I really needed he freezer space! You just never know when you will need to dip into what you have and I was so blessed to be prepared, so I could give to others. Thanks for your encouragement, Patsi, in preparing, so we are ready when a need arises.